Evangelical Christian preacher Pastor James McConnell has been found not guilty of making "grossly offensive" remarks about Islam. 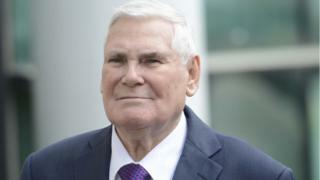 The 78-year-old, from Shore Road in Newtownabbey, County Antrim, denied two charges relating to a sermon he gave in a Belfast church in 2014. A judge said while he considered the remarks offensive, he did not consider them "grossly" offensive under the law. Supporters of the pastor applauded when the verdict was given. Speaking outside Belfast Magistrates' court, Mr McConnell said his only regret was the response from the Muslim community that he was "out to hurt them". He said: "There was no way I was out to hurt them. I wouldn't hurt a hair on their head. "But what I am against is their theology and what they believe in." He said he would do it again, but would be conscious that he was "hurting innocent Muslims". Mr McConnell had denied two charges - improper use of a public electronic communications network and causing a grossly offensive message to be sent by means of a public electronic communications network. He made the remarks at the Whitewell Metropolitan Tabernacle in north Belfast in May 2014. His sermon was also streamed online. During the trial, Mr McConnell said that he still believed in what he had preached, and did not go into church to "provoke anyone". A prosecution lawyer had said his words were not "a slip of the tongue", while a defence lawyer said he should not be convicted. Judge Liam McNally told the court he did think the pastor's passion in preaching meant it "had caused him to lose the run of himself" and advised him to consider the impact of his words in future. However, he concluded that the words upon which the charges were based, while offensive, do not reach the high threshold of being "grossly offensive". "The courts need to be very careful not to criminalise speech which, however contemptible, is no more than offensive," he said. "It is not the task of the criminal law to censor offensive utterances." In a statement, the Belfast Islamic Centre said the Muslim community in Northern Ireland believes in the freedom of expression, but added that "insulting other faiths and beliefs" leads to "disunity and mistrust". It said: "We Muslims are looking forward to achieving and maintaining the values of coexistence and diversity. "We are mindful of some voices trying to push towards disintegration and isolation of some religious and ethnic minorities. "Although we disagree with the description of Pastor McConnell's remarks as 'not grossly offensive', we have always been ready to implement the values of forgiveness and pardon as a way forward." The Democratic Unionist Party (DUP) MP Sammy Wilson and Catholic priest Fr Patrick McCafferty appeared as character witnesses for Mr McConnell. Speaking on BBC Radio Ulster's Talkback programme, Mr Wilson welcomed the news, saying Mr McConnell "should never have been in court in the first place". He said: "Anyone who is engaged in public debate or speech ought to be happy at the result today. "We live in a free society and in a free society, people should be free to express the beliefs that they hold." He added that if Mr McConnell had accepted a police caution, it would have introduced "a chill factor" into issues of public speech. Peter Lynas, of the Evangelical Alliance Northern Ireland, said the verdict was "a victory for common sense and freedom of speech". "However, until the law is changed or clear guidance is issued there will still be concern about further prosecution," he added. "The Public Prosecution Service (PPS) need to explain why this case was brought and assure everyone that this will not happen again." Boyd Sleator of Atheist Northern Ireland said: "His (Mr McConnell's) comments were offensive but we are allowed to be offensive and I would never want to see anybody prosecuted for being offensive. His comments were idiotic, his comments were silly," he said. In a statement, the PPS said "it was clear from the judgement that the court considered Pastor McConnell had a case to answer and that the decision on whether the comment was offensive or grossly offensive was not only finely balanced but one for the court and the court alone to take". "The decision to bring this prosecution was entirely consistent with the duty of the PPS to put before the court those cases in which it is considered there is a reasonable prospect of a conviction."